These treats are so easy to make! You will only need three ingredients! Yes! THREE ingredients! I feel like I am shouting this to the world, but you will be amazed that it is so simple to make a frozen goodie without ice cream or spending a lot of dough. I love these kinds of recipes, because you can make a huge batch, freeze them, and serve as needed. This will be a life saver this summer with the boys home all day. I stumbled across this idea on facebook, but was unable to find a link to the recipe. It was just a post with the recipe displayed. I read a few of the comments and people have added all kinds of fruit, cream cheese, and more. I think this idea is basic enough to get creative and have a little fun! I am planning a "banana split" version with bananas, cherries, strawberries, and pineapples. Do you have any flavor combo ideas? 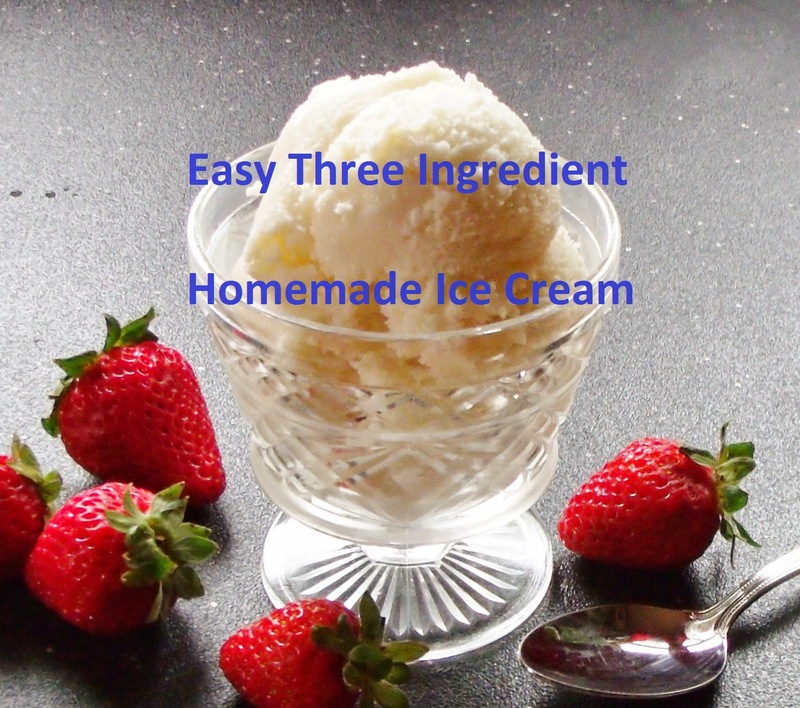 I love homemade ice cream- the texture, taste, and sweetness are incomparable to the store bought variety. However, I despise the idea of using raw eggs and large amounts of cream. I stumbled upon this simple recipe in the book that came with my ice cream machine. It is wonderful! It was originally for chocolate (and it tastes great by the way! ), but we have adapted it for vanilla numerous times. I thought I would share this wonderful recipe. It's fast and simple. It's perfect for the occasions when you are in a rush and want to enjoy your time elsewhere. 15 Tablespoons cocoa powder or 2 Tablespoons vanilla flavoring- it just depends if you want chocolate or vanilla! In your container mix the milks and vanilla/cocoa well. Add the dash and cover. Insert it into the machine. Prepare your machine and get the freezer ready with ice and salt. Turn it on and check periodically. I let mine go until the ice cream reaches the top of the lid. Remove the dash and check for flavor. That's my favorite part! Just be careful not to get salt in the ice cream. When finished, pack with ice and cover with a towel. I prefer to remove the canister to a deep freezer for an hour or two. We love fresh strawberries as a topping on our ice cream, but we'll eat it plain or flavored. How do you like to eat your ice cream? I have decided it's time to tell everyone the big news! My family and I have been waiting for the perfect opportunity to announce that we are expecting three little ones this summer! Please, if someone is in the Sandhills area, stop by and check on Mom for me. I bet she fell off her chair and may be in shock laying on the Library floor. I am hoping that she reads another paragraph before calling everyone or announcing the news on facebook. We are officially nesting and anticipating the arrival of three chicks! About two weeks ago we noticed a few changes in the backyard. A pair of birds had begun a nest in the cranny of an old hanging planter by our backdoor. They resemble sparrows, but are a little smaller in size and have a wonderful song they trill outside my kitchen window. The male has a wonderful red head of feathers. 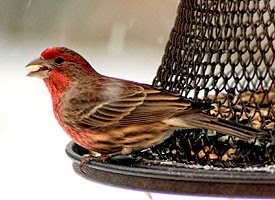 I think they are House Finches, but have also seen them on the Internet as red headed sparrows. I have a picture of the father, but it wasn't easy to see him. SO I found this photo from the site All About Birds. I have to say that I am glad another "ginger" settled in, I was starting to feel like I was the only redhead in the neighborhood! Last Friday morning, we noticed one speckled egg. By that evening we had three! We will keep you updated with our nesting experience and provide a lot of pictures. We have officially gone to the birds. Proud Papa in my plum tree! Hint, he's the splotch of red- not the robin! WE FOUND ANOTHER NEST IN THE BLACKBERRY BUSH! Here is a preview of this little gem. Stay tuned for more updates from the bush . . .
Spring has been playing hide and seek with us this past month. I have been seeking, but not finding it. I finally forfeited the game and decided to bring a bit of Spring to us. This was much easier than relying on Mother Nature and it didn't take long to get excited about new plants and the promise of nicer days. The children really enjoyed this activity- they even named their little critters! These "hungry caterpillars" are simple and provide a high entertainment value for the preschool crowd. I read the book The Very Hungry Caterpillar by Eric Carle and we talked about the life cycle of a butterfly. If you look closely, you can see the boys included eggs on their leaves! We even shared a discussion about the anatomy of a leaf. You can make this craft simple or expand on several biology concepts. Just remember to have fun! Color your leaf and add a stem, primary vein, and lateral veins if you desire. Decorate the strips and design your caterpillars. Insert the pipe cleaners for antennae. Roll the end over to create a round face. Attach with a staple or piece of tape. Draw a face for your new friend. Attach the body to your leaf. Start at the head and secure it to the leaf using a stapler or piece of tape. Gently lift the body and create a small mound. Secure that section to the leaf. Finally, you have created your own friend! Do you have any fun ways to bring Spring inside?